Speaking to investors, Royal Caribbean Cruises Ltd. Chairman and CEO Richard Fain provided guidance on the cruise line's plans for roll out of its new smart phone app across all brands. "Today, I thought it would to show you just how aggressively we are rolling out these capabilities to our guests. I would emphasize that our guest capabilities represent just one dimension of the program, but it's a highly visible one." "The guest app, in its current form, includes features such as accelerated check-in, the daily planner, onboard accounts, shore excursions, as well as the ability to book various items such as shore excursions, specialty restaurants and other onboard activities." 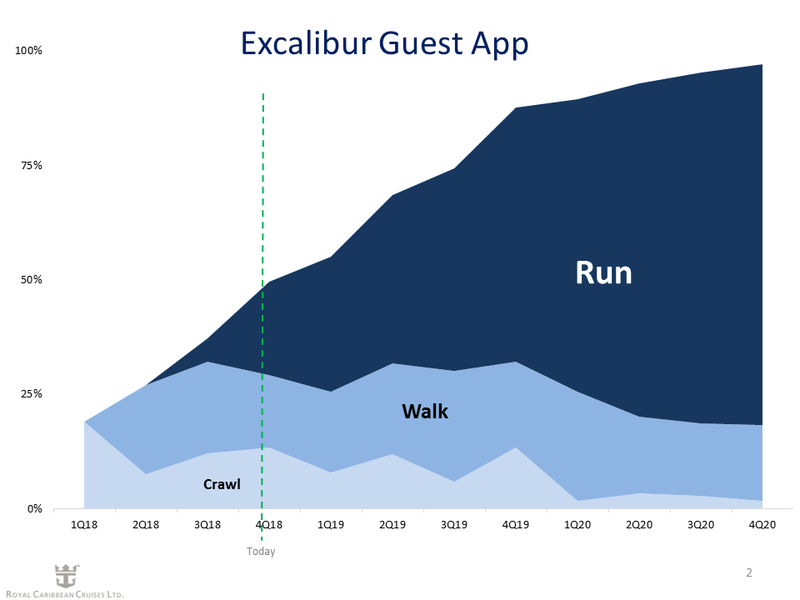 "You can see in the slide that we've highlighted three milestones that represent the way we make the app available to our guests. We call them, crawl, walk, run. The first phase, crawl, refers to testing mode. In crawl, mode, the app is up and running, but we keep it very quiet so we can test it out with a small group of participants. When we are comfortable that the functionality has reached an acceptable level, we shift to the walk stage. When we get to walk, we allow everyone who wishes to do so to use the app, but we don't aggressively push it. This is roughly equivalent to the beta stage of most apps. It gives us a chance to test it under real-life conditions, but only with a limited group of users. Lastly, when we get to the run phase, we want as many guests engaged as possible. The app is then available to anyone and we vigorously publicize it, so that as many guests as possible use it. When we get to the run stage, the app has been thoroughly vetted and most of our guests use it and love it. Our initial priority for the app capabilities has been on easing the process of boarding and disembarking. We've also prioritized other things that our guests most want. Next will come more bells and whistles, such as facial recognition, the ability to easily book your onboard activities before sailing, new chat capabilities, and an innovative digital stateroom key. Again, I want to repeat that this only refers to the capabilities our guests use. A lot of focus has also been on the capabilities on making our employees more efficient and more effective. Now, one question I am sometimes asked is how we can scale this so quickly out to our fleet. The reason is that over the years, we have built and maintained our fleet to take maximum advantage of technology. As a result, we already have a lot of technology on the ships that can be used to provide some of these capabilities. We need to add more, but this gives a definite leg up." Royal Caribbean Chief Financial Officer Jason Liberty also spoke of the rapid pace the cruise line is taking to get these new technology initiatives online sooner than later, "We are very much trying to accelerate our Excalibur efforts to the point that we can...to have certain capabilities come online a little bit quicker than we had expected them to."